Born at Petersburg, Virginia, on August 24, 1834, he was a career Army officer who distinguished himself in the Civil War. He was with the Seventh United States Cavalry, under the command of Brevet Major General George Armstrong Custer, at the Battle of the Big Horn in June 1876. His was one of the columns that Custer split, his being sent on another route to the Indian encampment, thus sparing he and his command. After hard fighting with the Indians who had destroyed Custer, and after suffering many casualties, the Indians retreated and Benteen and his small command were rescued. He died in Atlanta, Georgia, on June 22, 1892 and was buried in Section 3 of Arlington National Cemetery. 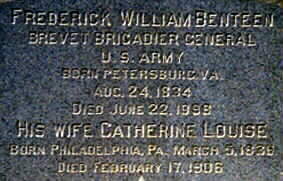 His wife, Catherine Louis Benteen (5 March 1839-17 February 1906) is buried with him. 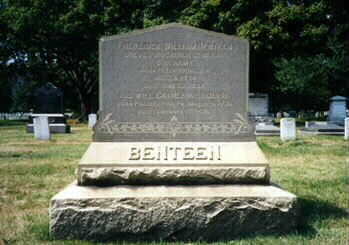 His son, Frederick Wilson Benteen, Lieutenant Colonel, United States Army (27 March 1873-20 July 1956) is buried nearby. Born on August 24, 1834, in Petersburg, Virginia, the son of Theodore Charles (1809 - March 9, 1885) and Caroline Hargrove Benteen (1810 - October 1841). Moved to St. Louis in 1841. Entered military service from Missouri as first lieutenant, Company C, Missouri Volunteer Cavalry, on September 1, 1861. Appointed captain on October 1, 1861. Engaged in the actions at Wet Glaze and Wilson's Creek, and the skirmish at Salem. Married Catherine Louise Norman on January 7, 1862, in St. Louis. In the actions at Bolivar and Milliken's Bend, the battle of Pea Ridge, the skirmishes at Springfield, Sugar Creek, Batesville, Cotton Plant, Kickapoo Bottom, Greenville and the defense of Helena. Appointed major, 10th Missouri Cavalry, effective December 4, 1862. In 1863 he was in the skirmishes at Florence and Cane Creek, the siege of Vicksburg, the actions at Iuka and Brandon Station and the capture of Jackson. Appointed lieutenant colonel on February 27, 1864. In the actions at Bolivar and Pleasant Hill. Commanded the 4th (Winslow's) Brigade of General Pleasanton's Cavalry Division in engagements on the Big Blue and Little Osage Crossing in Missouri. Engaged at Charlot and in the skirmish at Montevallo. Commanded his regiment in the assault and capture of Selma and the raid on Columbus. Mustered out on June 30, 1865, at Chattanooga, Tennessee. Appointed Colonel, 138th U.S. Colored Infantry, from July 1, 1865, to July 15, 1865. Recommended on June 6, 1865, for brevet brigadier general, Missouri Militia. Mustered out on January 6, 1866. Appointed captain, 7th Cavalry, effective July 28, 1866, the date the regiment was organized. Brevetted Major, USA, and Lieutenant Colonel, USA, on March 2, 1867, for service in the battle of the Osage and the raid on Columbus. Received the brevet of Colonel for gallant service in an engagement with hostiles on the Saline River on August 13, 1868. In the Washita campaign in 1868, the Black Hills expedition in 1874, the Sioux campaign in 1876 and the Nez Perce campaign in 1877 including the Canyon Creek fight on September 13. At the Little Big Horn on June 25, 1876, commanded a battalion (Companies D, H and K) on scout andCompany H in the hilltop fight where he was wounded in the right thumb. In 1878 he commanded a battalion against hostile Indians. Testified at the Reno Court of Inquiry in 1879 in Chicago. In arrest at Fort Meade, D.T., in October 1879. Appointed Major, 9th Cavalry, effective December 17, 1882. Suspended on April 30, 1884, from rank for one year at half pay for drunken and disorderly conduct at Fort Duchesne, Utah. On duty at Fort Niobrara, Nebraska, from April 27, 1888. He was retired for disability on July 7, 1888. Resided in Atlanta, Georgia. Brevetted Brigadier General on February 27, 1890, for gallant service at the Little Big Horn and against Nez Perce Indians at Canyon Creek. Died at age 63 on June 22, 1898, in Atlanta. Causes of death were paralysis, organic disease of heart of rheumatic origin and spinal lesion. Buried on June 25 in Westview Cemetery, Atlanta. Reinterred in November 1902 in Arlington National Cemetery. His widow Kate, filed application for pension on October 14, 1898, and received $20 per month until her death on February 17, 1906. Editor's Note: During the winter of 1995, while searching special collections at the University of Utah Marriott Library for material pertinent to his Statehood Centennial Series, Salt Lake Tribune staff writer Harold Schindler was shown the Richard W. Young Photographic Collection--five late 19th-century portraits of Young, his family and an unidentified group of soldiers at Fort Douglas. Young was a grandson of Brigham Young and the second Utahn to graduate from the U.S. Military Academy at West Point. In the group photo of the soldiers, Schindler recognized one of the men to be Maj. Frederick W. Benteen, who commanded Company H, Seventh U.S. Cavalry, during the controversial 1876 battle of the Little Bighorn in which Col. George A. Custer and more than 250 troopers were killed. Schindler set out to determine the circumstances of this hitherto unknown and previously unpublished photograph. He is unmistakable, even in a crowd; that boyish Dutch/English face--despite its 53 years, most of it spent in the out-of-doors--set Frederick William Benteen apart. There he sits, flanked by nearly a score of officers from almost every branch of the U.S. military--Indian Scouts, infantry, artillery, cavalry--none seemingly identifiable but he and one other, Second Lieutenant Richard W. Young, a Salt Lake native, oldest son of Joseph A. and Margaret Whitehead Young; a West Point graduate assigned to Fort Douglas with the Fourth Artillery. Benteen was the toughest frontier officer in the cavalry. Holding the rank of major, but with the authority of a brevet (temporary) colonel, he later was breveted to brigadier general for "gallant and meritorious services" at the Little Bighorn and Canyon Creek Indian battles in Montana Territory; he was the only officer so honored for the Little Bighorn. Benteen's courage was legendary. Anyone who has read of the one point, a hostile bullet blew the heel from his boot. Still he made no effort to take cover. Charles K. Mills, in his book Harvest of Barren Regrets: The Army Career of Frederick William Benteen 1834-1898, described his subject as having "a large, round and smooth-shaven face. (He grew a scraggly moustache from time to time, but never sported a beard.) This, coupled with his large, round, blue eyes, gave him a distinctive cherubic appearance. One reporter who described him in 1879 remarked that he might have been mistaken for an overgrown drummer boy." He was tall, broad-shouldered, with a large torso, long muscular arms and huge hands. He was formidable in combat, including the hand-to-hand variety. "Physically," Mills wrote, "Frederick W. Benteen was impressive." And like most frontier soldiers, he enjoyed an occasional drink. So what was this old war horse doing in Utah? Not in the Crowd: Because of his attitude toward the late Col. George A. Custer--he considered him an arrogant, boastful loudmouth and was not in the least shy in sharing this opinion with others--Benteen was ostracized by members of the "Custer crowd." Unfortunately, most of Custer's admirers in the military were high-ranking officers. In Utah Territory, the Utes on the Uintah reservation were becoming restless because, as historian Mills expressed it, "of alleged inequities at the agency and smoldering resentment over their forced removal from Colorado six years before." Now, in 1886, Chief Ouray was dead, and in the U.S. military table of organization, Maj. Benteen was ordered to command two troops of the Ninth Cavalry on a forced march to Fort Bridger; from there to proceed to the Ute Reservation and build an army post to be known as Fort Duchesne. Benteen's orders were signed by Brig. 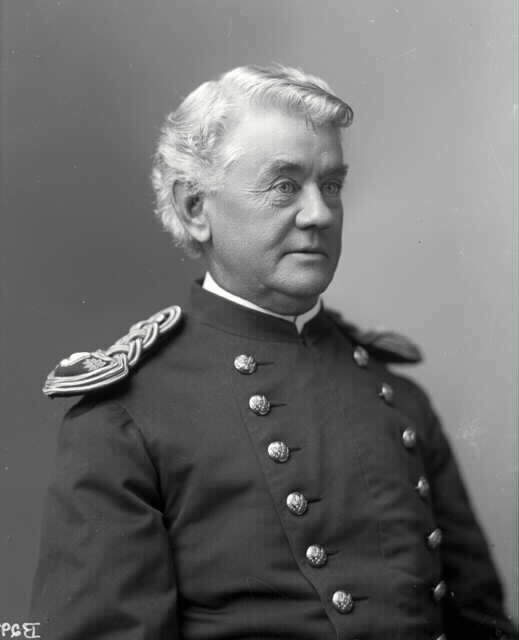 Gen. George Crook, who had botched a fight at Rosebud Creek in mid-June 1876 against the same Indians who rubbed out Custer a week later at the Little Bighorn. That earned him the nickname "Rosebud George," and Crook was more than a little sensitive about anything or anyone reminding him of it. Furious and Frustrated: On the day Benteen arrived with his troops, Crook departed for his headquarters in Omaha and left the major in charge of constructing the "fort." There was no lumber, no nails, no plans. It would be putting it mildly to say that Benteen was furious and frustrated. As Mills explained it, the situation became a fiasco. Necessary supplies were unavailable and delayed, forcing the command to live in tents until almost January 1887. All the essentials were slow in arriving and then only at inflated prices. Never one to mince words, Benteen was sorely put out by the apparent incompetence of the military supply system. It was enough to drive a man to drink. Whatever else was in short supply at the fort site, whiskey was not. The Post Trader had an abundant inventory. Benteen's problems began multiplying in September '86, about a month after he rode in. A wagon train from Fort Bridger had finally made it to Duchesne and brought with it Lt. and Mrs. Harry Bailey and Lt. Harry G. Trout, another West Pointer newly assigned to Duchesne's cavalry unit. Benteen ordered a tent erected for the Baileys. After the usual welcoming chitchat among the Baileys, Trout and others of the garrison (a second officer's wife was also present), Maj. Benteen, according to Capt. J.A. Olmstead, excused himself, stepped around the corner of the wall tent, and "not more than 10 feet from where the ladies were sitting, urinated on the tent, so that we all heard it." In the days and weeks to follow, Benteen spent more and more time drinking at the Post Trader's store. On the night of Oct. 10, he got into an argument and was escorted to his tent by a junior officer after the tipsy post commander had fallen in the mud. A month later, Benteen again became embroiled in a dispute with an employee of the Post Trader and, one thing leading to another, he also began squabbling with a visiting sheriff. It almost ended in a fistfight. 'Fort DuShame': All this was a prelude to Gen. Crook's next move, which was to send an investigator to find out what was holding up construction of the fort. Benteen, it was said, believed there was skulduggery among the civilians to bilk the government. He referred to his station as "Fort DuShame," while others called it "Fort Damn Shame." The investigating officer, Maj. Robert Hall, spent a day "looking around," then left without questioning Benteen. When his official report was filed, it laid the blame on Benteen, alleging that he was "frequently unfit for duty through excessive use of intoxicating liquors." In mid-December, Benteen was relieved of command and ordered to face court martial on charges including the incident with the Baileys at the tent and the two occasions at the Post Trader's. The following February a letter appeared in the Kansas City Times, supposedly written by an unidentified enlisted man from Fort Leavenworth. It spelled out at length and detail Benteen's view of the problems at Duchesne. Benteen was suspected of writing the letter, but he denied knowledge of it. Conduct Unbecoming: Since Crook was cast in a bad light, the general naturally was furious over the publication. He tacked on another charge to Benteen's indictment, that of "conduct unbecoming an officer and gentleman," specifying that it grew from the abrasion with the sheriff the previous November. After 17 days of proceedings in which Benteen argued that his problems with Fort Duchesne were not a result of his drunkenness, but because he was "too deucedly sober," he concluded: "Now . . . with my locks snowy white, gotten in the service of my country, it is just a little too severe to be court-martialed for not falling in line with a Post Trader and Contractor." He was found guilty on three counts of drunkenness and of conduct unbecoming an officer and was sentenced to be dismissed from the U.S. service. 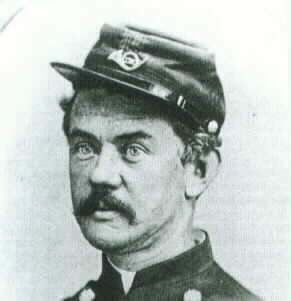 So Maj. Frederick W. Benteen, Ninth U.S. Cavalry, on March 9, 1887, left for Fort Douglas to sit out the review process on his case; The Tribune took notice of his arrival in Salt Lake City with this brief mention on March 12: "The Major is a fine-looking man with an enviable civil war record that will stand him in stead for the rest of his life. . . .With his snow white hair and ruddy weather-beaten face, [he] brings up at once to mind the typical Revolutionary soldier. A jollier, warmer-hearted man never lived. But he doesn't love the Mormon Church; he has no Solomon's song to sing over her; she isn't to him any Rose of Sharon-Lily of the Valley business." Nevertheless, that is how Lt. Young of the Fourth Artillery and Maj. Benteen of the Ninth Cavalry, awaiting word concerning his career, came to share a photograph with what appear to be the other officers at Fort Douglas that day in 1887. Jess McCall, director/curator of Fort Douglas Museum, was instrumental in helping pinpoint the precise location of the scene as the porch of building No. 7 on Officer's Circle. Other than Young and Benteen, the other 18 officers remain unidentified, but it is likely that the commanding officer, Lt. Col. Nathan Osborne is among those in the photo. When Gen. Philip Henry Sheridan reviewed and endorsed the findings of the court martial, he recommended "remission of sentence," based on Benteen's service record. President Grover Cleveland mitigated the dismissal from service to suspension of rank and duty for one year at half pay in view of the officer's long and honorable service and his reputation for bravery and soldierly qualities. 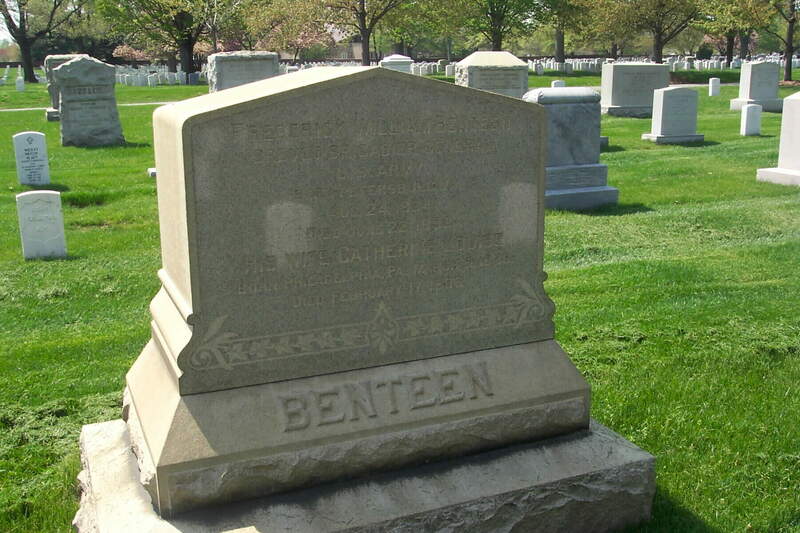 On July 7, 1888, Benteen took a medical discharge and retired to Atlanta. He died June 22, 1898, and was buried in Westview Cemetery. His body was moved to Arlington National Cemetery, his final resting place, in November 1902. WASHINGTON, November 13, 1902 – The remains of Colonel Frederick W. Benteen, of Virginia, who died in June 1898, have been disinterred from the cemetery at Savannah, Georgia, and will be interred in the National Cemetery at Arlington on Saturday morning with military ceremonies. 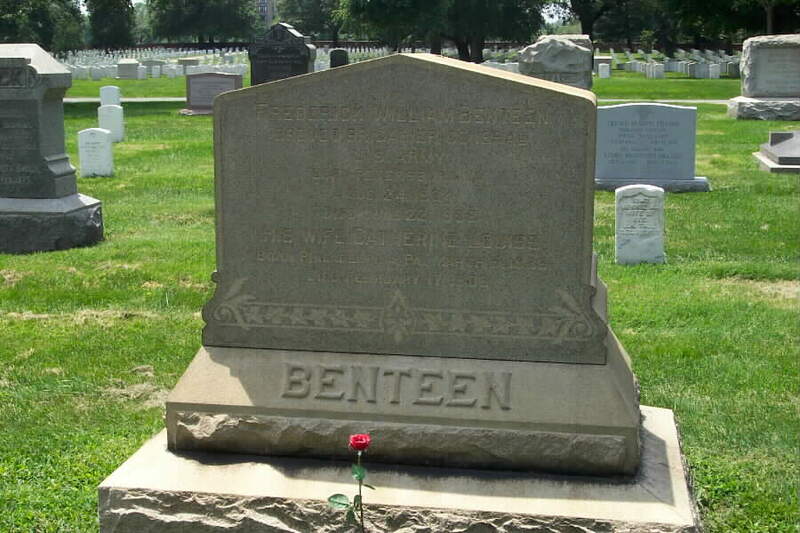 Colonel Benteen was a distinguished cavalry officer and served with General Custer in his Indian campaigns. He was retired in July 1888.